Fall is in the air, and soon the holiday season will be upon us. But not if one devilish evildoer has his way. The Grinch returns this November, just in time for the Thanksgiving holiday, and if the newest trailer is any indication, the mean one is ready to completely demolish our Christmas spirit for good. This winter, Illumination and Universal is asking fans to scheme big. 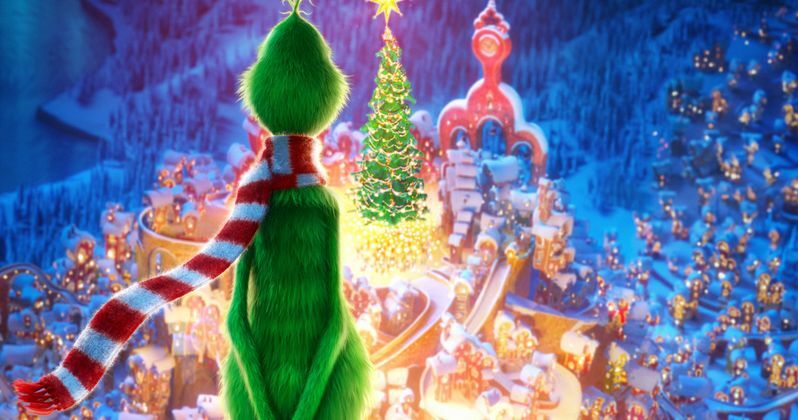 Today, we have the latest trailer for The Grinch, along with a colorful new one-sheet that offers a look down at Whoville and all its doomed inhabitants. For their eighth fully animated feature, Illumination and Universal Pictures present The Grinch, based on Dr. Seuss' beloved holiday classic. The Grinch tells the story of a cynical grump who goes on a mission to steal Christmas, only to have his heart changed by a young girl's generous holiday spirit. Funny, heartwarming and visually stunning, it's a universal story about the spirit of Christmas and the indomitable power of optimism. Related: Can The Grinch Steal the Box Office Away from Bohemian Rhapsody? Academy Award nominee Benedict Cumberbatch lends his voice to the infamous Grinch, who lives a solitary life inside a cave on Mt. Crumpet with only his loyal dog, Max, for company. With a cave rigged with inventions and contraptions for his day-to-day needs, The Grinch only sees his neighbors in Who-ville when he runs out of food. Meanwhile, down in Who-ville, Cindy-Lou Who, a young girl overflowing with holiday cheer, plots with her gang of friends to trap Santa Claus as he makes his Christmas Eve rounds so that she can thank him for help for her overworked single mother. As Christmas approaches, however, her good-natured scheme threatens to collide with the Grinch's more nefarious one. Will Cindy-Lou achieve her goal of finally meeting Santa Claus? Will The Grinch succeed in silencing the Whos' holiday cheer once and for all? Find out, Christmas season 2018. This animated movie is in theaters starting November 9. And it will feature new songs by Tyler, The Creator. Right now, Benedict Cumberbatch is the sole cast member listed for this adaptation of the popular Christmas perennial. The movie is directed by Scott Mosier and Yarrow Cheney with a screenplay from Michael LeSieur and Tommy Swerdlow. It is based on the book by Dr. Seuss and is produced by Chris Meledandri, Janet Healy. Illumination dropped the third trailer today, and you can check out the cool new poster too.